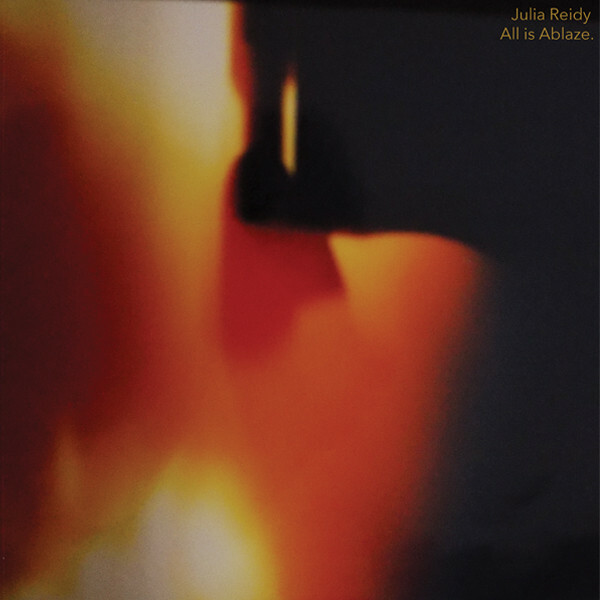 All Is Ablaze (FEEDING TUBE RECORDS FTR338) is a very good album of solo guitar work by Julia Reidy, an Australian musician currently living in Berlin where this album was recorded in a studio by Owen Roberts. The Auckland guitar genius Dean Roberts (he of Thela and White Winged Moth) appears to have been the catalyst for this album’s release by Feeding Tube, proposing her name in direct response to a query, and he not only endorses the unique talents of Reidy but also supplies an extensive sleeve note, which has more detail, awareness of musical history and perception of nuances in her playing than you could wish for. Julia Reidy plays acoustic guitar on the A side, and she can’t seem to stop when she gets going; ‘All Is Ablaze’ is a continuous meditation of some sort, with the arguments and observations just pouring out of her. One thing I like is how parts of the chain of thought are just sketched in with rather blurry wide-brush painting washes, while other statements are delivered with a hard and sharp clarity. This is reflected not just in the range of playing styles she commands (which are many, evidently) but also in the thought processes that are taking place – it’s not often that we get to hear a musician thinking out loud as they play. With Derek Bailey, I suppose we could hear his brain at work in any given guitar solo, but quite often his thoughts could seem somewhat guarded, with one statement cancelling out another; Julia Reidy, conversely, is up for a good discussion. One particularly pleasing effect on the acoustic – which I think might be a 12-string – is her way of blurring and blending separate notes and playing in such a nimble way that they seem to add up to chords. This feels different to defaulting to the familiar chord shapes which lesser strummers fall back on; she might be trying to milk new phrases from the lexicon of the guitar. The B side is called ‘Thatched Steel & Rain’, where she shifts to the electric guitar (an instrument with which she began her musical career) and turns in something astounding, which may have begun life as the cover version of a song. Strikingly avant; barely even sounds like a guitar now. Overdubs and effects allowed also. It’s full of a surprising number of twists and turns considering its brevity (it might almost fit on one side of a 7-inch single), and is even less conventional than the flip – showing Julia Reidy has no fear of neither noise nor melody in the context of free guitar playing. At the start her detuned wobbliness reminded me of Hans Reichel, whereas at other points I could almost hear the grandeur of Popol Vuh. I must revisit this compacted musical riddle; I’m sure there’s something more locked up in it. If nothing else, I think this indicates we’ve found a musician who doesn’t care to follow rules of any sort, and is capable of pursuing a very singular, imaginative vision. From 3rd January 2018.